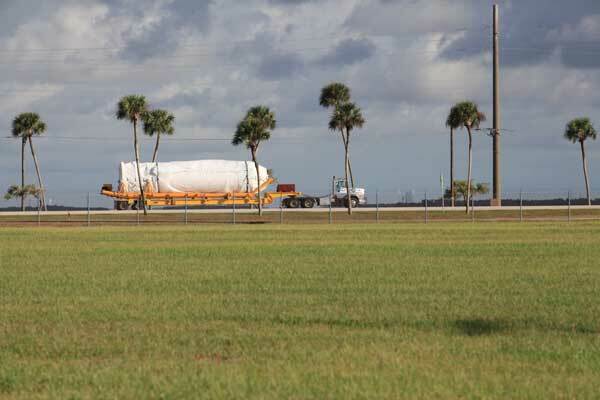 CAPE CANAVERAL, Fla. (ULA PR) — The dual-engine Centaur upper stage that will launch Boeing’s first Starliner spacecraft on its uncrewed Orbital Flight Test to the International Space Station has arrived at Cape Canaveral for final processing by United Launch Alliance technicians. The venerable Centaur will resume flights in a dual-engine configuration — which was once commonplace — for this inaugural launch of Starliner. The last Centaur stage to utilize two engines was an Atlas IIAS rocket launch in 2004. For the OFT launch, the Centaur will be powered by a pair of Aerojet Rocketdyne RL10-4-2 cryogenic engines, burning liquid oxygen and liquid hydrogen to generate nearly 45,000 pounds of thrust. Centaur flew for the 250th time on Oct. 17 in launching the Air Force’s AEHF-4 protected communications satellite. Two-thirds of those previous launches were dual-engine configurations. J-2X was never needed for the EUS. Developing it was just a dumb decision all around. No engine out capability for most of the flight, if any. If either RL-10 fails the crew is probably going in the drink. Fortunately, RL-10 is one of the most tested and reliable engines around. Why? Methane upper stage has no significant advantages over the RP-1 stage, compared to the large amount of work it would take to get it flying. Methane is not a great choice unless you are reusing the upper stage and/or landing it on Mars, both of which require the other features of BFR (the ones you say are a “step too far”). Methane is often represented as “higher energy”, but the truth is that it’s lower density more than cancels the higher specific energy by increasing the stage dry mass. Even when sub-cooled, it has no better performance than sub-cooled kerosene. It’s better for deep-space operations, but kerosene is entirely feasible for that as well. There’s no reason to do methane without full reuse. And full reuse means BFR. The less government money in the BFR/BFS the better. Government involvement will just slow it down. It’s a lesson Boeing used to know under President Bill Allen who made Boeing the leader in commercial airliners. either its a legitimate advantage or an excuse to tac on a price tag either way the military and associated industrial complex liked them. Additionally at this point the tameness of expander cycle also takes on another advantage. It’s a lot safer to adapt to 3d printed parts. Thrice you use ‘anent’ – is it a typo (for ‘about’) or what does it mean ? It’s an archaic word meaning “in regard to”. He’s possibly the only person left on Earth who still uses it. I’ve been reading avidly for 45 years and have wide experience with obscure words, but anent was a new one on me too…. Much obliged – I thought he had a bug in his phone.